We also provide add-on covers such as Nil Depreciation Cover and Personal Accident Bundle Cover to enhance your bike insurance Protection further. You can also opt for the Long Term Two Wheeler Insurance Policy and ride worry Free for up to 3 years. 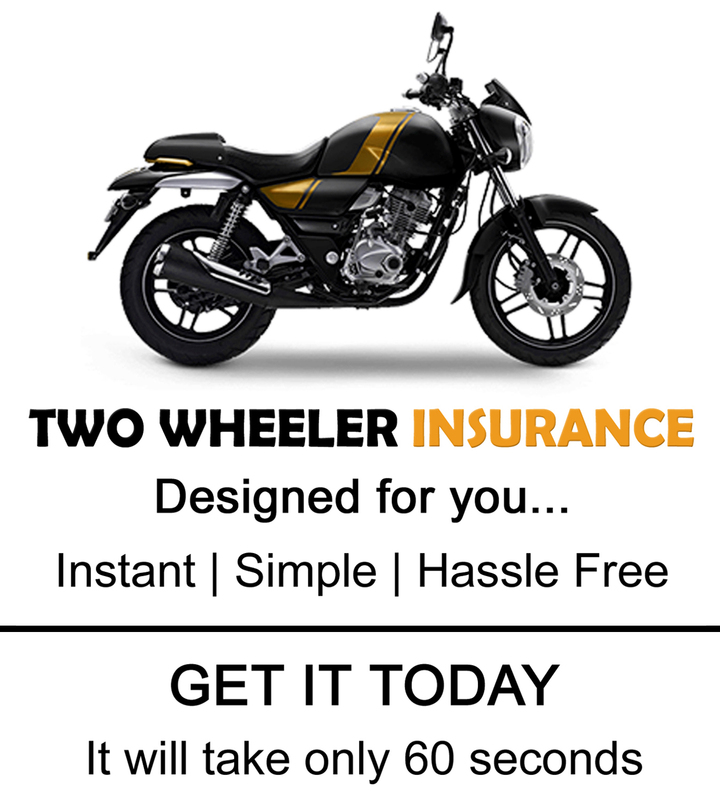 Why is two wheeler insurance necessary? Avoid Financial Losses:- Two Wheeler Insurance protects you against the financial losses that could occur due to unforeseen accidents. Mandated by Law:- Riding without a valid two wheeler insurance policy is punishable by law. Peace of Mind:- Being financially prepared even for the worst case scenario will give you a sense of peace. Cashless Repairs: Experience great convenience by getting your bike or scooter repaired at any network garages, cashless! Nil Depreciation: With this add-on, secure your Two Wheeler against a reduction in the value of parts with age. You will get the parts replaced without any pinch to your wallet. Personal Accident Covers: This cover offers protection against an accident, anywhere across the globe, regardless of who is driving. With this, you are insured against Accidental Death and Permanent Total Disablement. ​​​What are the different types of two wheeler insurance coverage? When you are riding on the roads you are exposed to numerous risks. While a standard two wheeler insurance plan offers basic protection, you can enhance your two wheeler insurance protection by opting for add-on covers such as Nil Depreciation Cover and Personal Accident Cover. When you don't file a claim during your bike insurance policy period, you will be eligible for a discount on your next premiums. This discount is referred to as a No-Claim Bonus. The No-Claim Bonus discount will keep increasing progressively for each claim-free year until your bike insurance premium is reduced up to 50%. The IDV (Insured Declared Value) is the current market value of your vehicle which is calculated after deducting the depreciation amount. It is a crucial component of a two wheeler insurance policy as it determines the amount of compensation. In case of theft or total destruction of your bike or scooter, the IDV is offered as "Sum Insured". Calculate your motorcycle insurance policy premium online and get a clear picture of the expenses involved. Purchase your two wheeler insurance policy through various payment options like Debit/Credit card, Net Banking, etc. We don't just sell Two Wheeler insurance; we also make sure our customers get the maximum value for money on their Two Wheeler insurance. Claim NCB: NCB is a cumulative bonus which is rewarded for every claim-free year. You can secure a discount of up to 50% for 5 consecutive claim-free years. Choose your Bike/Scooter CC Wisely: The higher the engine cubic capacity (CC) of your Two Wheeler, the higher will be the two wheeler insurance premium. So, choose the exact variant of your two wheeler to get the exact premium for the insurance. Know The Age of Your Two Wheeler: Older bikes have a lower Insured Declared Value (IDV) due to the accrued depreciation over the years. Hence the premiums for older bikes are lower and vice versa. What Does Your Two Wheeler Insurance Policy Cover?